Having seen Finland thrive over the last 20 years in just about every niche of metal that exists, with a particular emphasis in the melodic death, old school death, Gothic and black sub-genres, it is quite difficult to imagine a time in which this was not one of the centers of all metaldom. And yet, the 80s were such a time, with only a handful of heavy and thrash metal bands gaining a reputation through the European underground and potentially whispered about here in the states. 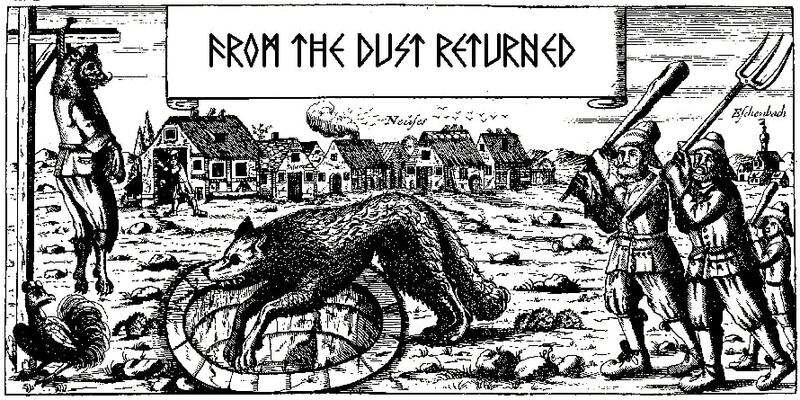 Don't get me wrong, there were some GREAT bands from this era, like the mighty Stone, or the classics Tarot and Oz, or A.R.G., or Antidote, but with the possible exception of those first 2-3, you just didn't hear much about this scene over here in the States, and even then only when you went looking. 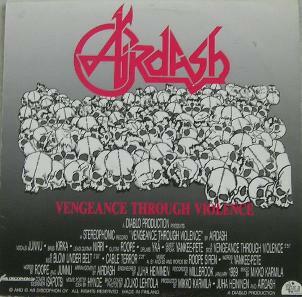 But since I'm occasionally in the habit of jerking some obscurity from the ether, I present to you a limited press EP by another Finnish thrash act known as Airdash, which definitely sounds like a move you'd throw down in an early Street Fighter clone, maybe King of Fighters, Fatal Fury, etc. Vengeance Through Violence is a three-track vinyl EP released between their second and third records, Hospital Hallucinations Take One and Both Ends of the Path. Or, more accurately, it's a single for one of the tunes off the former album, the title track, packaged with a couple of tracks that are unique to to the 12", or at least one of them is, and another appears to be re-recorded from one of the band's demos. These guys played a style of thrash pretty typical for the time, with meaty riffs that kept busy while hinting only slightly at the technicality other acts from Europe were employing at this same time. I like the brash, raw but brutish tone of the guitars, the winding mute patterns of the title track that keep my head banging up to the chorus with it's excellent gang shouts. But I'll be honest in saying that it sounds a hell of a lot like Belladonna-fronted Anthrax, only with the rhythm guitars more firmly planted in the late 80s Exodus camp. There are plenty of minor differences, but the overall sound is very much an American, urban street thrash rather than the Teutonic brilliance or savagery, and that works for me, because "Vengeance Through Violence" is actually a solid cut. "Blow Under Belt" is similar, but the guitars patterns here make it feel more like a party thrash version of something that might have been left on Master of Puppets' cutting room floor. Maybe a little Whiplash, Xentrix, or if you can remember the East Coast band I.N.C, it cultivates that sort of silly atmosphere with the way the guitars break up in the chorus. Not a terrible track, but less robust and effective than the first. 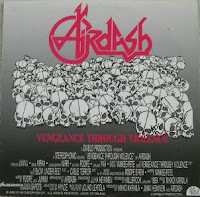 Sadly, "Cable Terror" with its staggering verse riff progression isn't much of an improvement; despite a great gang shout in the chorus, it just doesn't hook me overall, and I'd even say the production on these two doesn't seem as good as "Vengeance...". In the end, we can figure out why this EP wasn't named after one of those, or why they didn't wind up on the full-length, but I can certainly say that if you're feeling the material, then it wouldn't be a bad idea to check out ANY of their three full-lengths, since it's not a far cry from even the debut Thank God It's Monday. These are hardly top tier, or even B-tier records, but if you're nostalgic for the purity of the scene's underground in the 80s they're nothing I'd scoff at...just make sure you head for whatever you can find from Stone or A.R.G. before bothering.